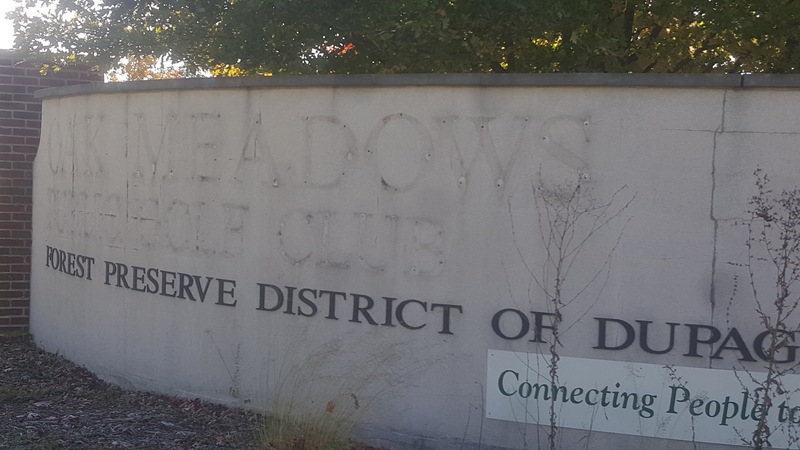 The letters now missing from the signage signify that Oak Meadows’ days as a golf course are done. The course reconstruction is done, at least for this fall. Course architect Greg Martin has the new routing for what had been the Oak Meadows golf course in place, the turf is starting to grow in and the Wadsworth Construction equipment is departing the 288-acre property in Addison. In short, the anticipation is growing – even with cold weather about to curtail another Chicago golf season. In just a few months this chunk of land will be the most talked about course in at least the Chicago area, and it should be. This isn’t just a golf course renovation. It also involves environmentally-driven restorations and wetland creation – and all that doesn’t come cheap. 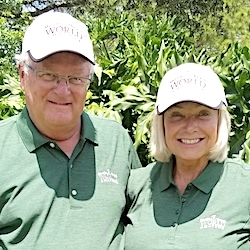 DuPage director of golf Ed Stevenson is anxious to open a new golf course. Ed Stevenson, director of golf for the DuPage County Forest Preserve District, estimates the cost of those combined projects at $16 million and that doesn’t include the building of a clubhouse, which won’t likely be ready until 2019. Nineteen architects submitted proposals for that aspect of this massive project, four were interviewed and selection of the chosen one is imminent. Next order of business involves the naming of the new course. One thing is certain: it won’t be called Oak Meadows, which was a deteriorating, flood-plagued layout before its formal closing on July 7, 2015. The Oak Meadows signs were taken down at the conclusion of the construction period. Stevenson is heading the committee that hopes to come up with the new name in time for a mid-winter announcement. A committee of environmentalists, naturalists, ecologists, landscape architects and golf course personnel are pondering possible names and the best one from the group as a whole will be submitted to the DuPage board for approval. Frequent flooding on the course initiated discussions for a renovation years ago. Then, in 2009, lightning struck the clubhouse and an ensuing fire destroyed it. 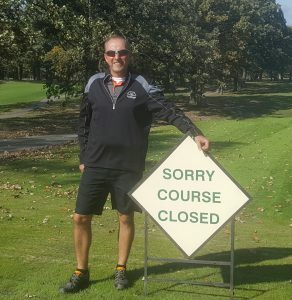 That misfortune stimulated more discussion on what should be done at this choice location, which has housed at least one golf course since 1923. 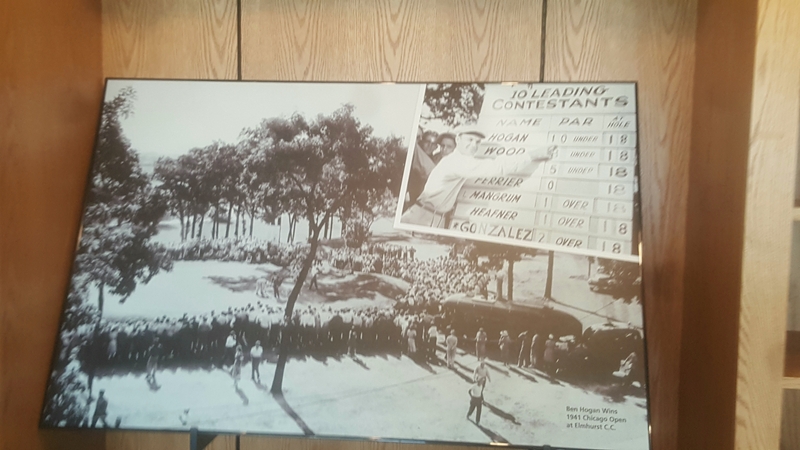 Pro shop photos show that Ben Hogan’s 1941 Chicago Open win hasn’t been forgotten. Originally the course was called Elmhurst Country Club, a private facility that hosted the 1941 Chicago Open – a big tournament won by the legendary Ben Hogan. For about 60 years Elmhurst CC existed beside another private country club, Brookwood. The courses went public in 1986, when the DuPage Forest Preserve District took over and started transforming what was there. Maple Meadows, which had 27 holes on basically the Brookwood property, operated side-by-side with Oak Meadows before Martin began his renovation. The 18 holes at Oak Meadows and the nine-hole East course at Maple Meadows were eliminated to make way for the new 18-hole course. Tee markers from the first and last holes are all that’s left of the Oak Meadows course. Solving the flooding problems from Salt Creek was vital in the reconstruction. Two dams were removed and 1.2 miles of the creek were restored throughout the property. Opening of the new course is targeted – most optimistically – for next Memorial Day weekend but play will likely be limited for a while after that first ball is struck. Regulars from the Oak Meadows days will find that the Nos. 1 and 18 holes look familiar. The rest of the course, not so much – if at all. While numerous trees were removed in the reconstruction process, about 500 native ones were planted. There had been 12 bridges on the property; now there are 10. The 20 bunkers on the Oak Meadows layout were removed and 54 new ones were built, all with the new high-tech Better Billy Bunker system that was put into use at Minnesota’s Hazeltine National in preparation for the recent Ryder Cup matches. The new bunkers will have white sand, a trademark of PGA Tour courses, and the course was re-grassed with T-1 bentgrass, another upscale feature that was well-received at Valhalla – a PGA Tour-owned championship course in Kentucky – among other high-profile clubs. One unfortunate part of the transformation was the elimination of an historic hole. The short par-3 sixteenth hole of the Oak Meadows course had the first island green in America. Charles W. Wagstaff, designer of the Elmhurst Country Club course, created it and such holes became popular world-wide over the years. Flooding concerns required the elimination of that hole in the new design. The revamped practice range will be unique. It’ll have six target greens and a fairway will be cut down the middle. 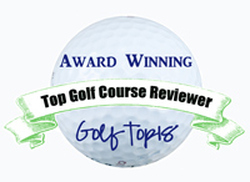 When completed the range can double as a six-hole course to be used in youth programs. In some spots the renovated course that was Oak Meadows looks ready to welcome golfers.